This is a new monthly (and possibly weekly) feature at Its All About Satellites. We are going to explore common technical issues and questions with Armando Lopez, Field Service Manager. What Are Cabling Restrictions for the New DIRECTV DRE for Hotels? The DIRECTV Residential Experience for Hotels (DRE) is a revolutionary system that lowers capital expenditures for the hotel and increases communication with the guest while providing an in-room TV experience that is what the guest is used to at home in terms of number of channels, on screen channel guide and even the remote control. With all the incredible benefits of the DRE system, there are cabling requirements that will ensure you are able to get a consistently great picture to all your TVs. Armando, what do hotel managers and owners need to know in terms of cabling requirements when they are want to install the DIRECTV DRE system in their property? Let’s start with some Hotel Television System Cabling considerations. First is how your wiring is distributed through your property. Today the DIRECTV REsidential Experience requires what is called Home Run Wiring. That is cable that runs directly from the guest or patient room to the main distribution room (MDF) or intermediate distribution hub (IDF). Another common way cable is distributed is called Loop-Through or daisy chained. Loop-through wiring connects from room to room in one continuous circuit throughout your property that has a splitter or DB value tap at each location. This type of cabling distribution is not currently compatible with the DIRECTV DRE system, but it us coming soon with a release scheduled for the 4th quarter of this year. Two other things you need to consider is Interconnects & Connectors (often called Barrel Connectors). Interconnects are a method of connecting two different distribution points on a property. Typically they are connected with hard line coax cable or fiber. Connectors are the cable terminators. They are what physically connects the parts of the system to the cables. Now that we have some of those definitions, what cabling restrictions are there for the DIRECTV Residential Experience and what do the hotels need to install the DRE system? Real simply there are 4 key things we are looking for when we are installing the DIRECTV DRE system. Home run type wiring with no splices, a maximum of 200 feet of distance from the distribution points to the furthest receiver, RG-6 Coax Cable rated to 3 gHZ, Compressions Connectors in high frequency wall plates. While there are some ways to overcome these cabling limitations for the DIRECTV DRE hotel television system depending on the types and number of splitters used in the distribution room, those are the basic guidelines for the type of cabling you need to have to install a DIRECTV Residential Experience system in your hotel. So how does a non-technical person like me tell what type of cabling they have in their hotel? I think the best thing to do is always to have an experience and DRE certified technician do a site inspection, but in layman’s terms the easiest way to tell if you have Home Run type wiring is to look at how many coax cables come into the distribution room. If there is one per room, then there is a real good chance its home run wiring. By taking a look at the diagrams of your hotel you can usually get a pretty good idea of how long the wiring runs are. While the wiring in the wall may be a few feet longer than the physical “as the crow flies” distances, it will be pretty close. All coax cable today has the type written on the outside of the cable. You are looking for something like this photo. Chances are if it is not labeled on the outside, you have older and substandard cable. 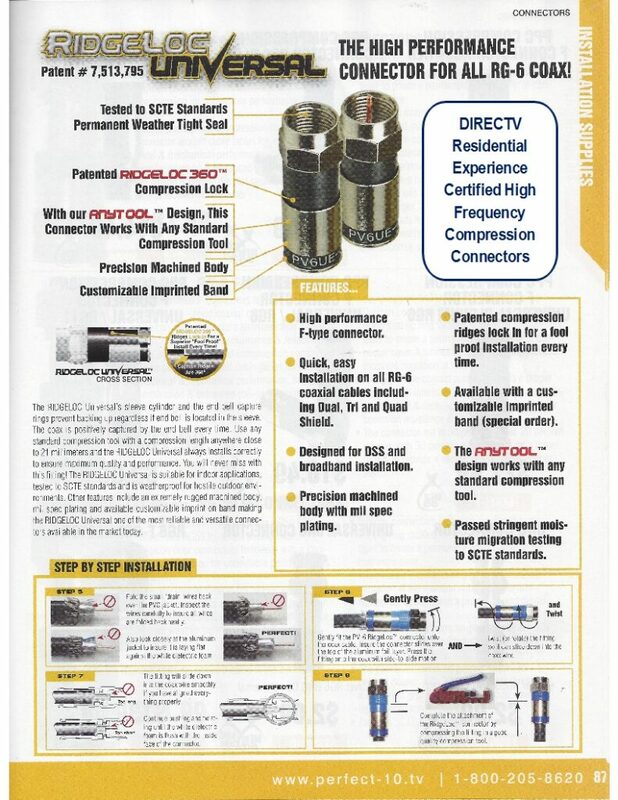 Compression connectors are a little harder to explain so can you include this photo of the one DIRECTV recommends? What kind of problems can workarounds on the 4 key cabling restrictions you gave us create? That’s a great question and there are two things you have to keep in mind. Number one, the problems it creates for the hotel and its staff. Problems with the TV often cause headaches for hotel staff in dealing with guests. Things like moving guests to another room, scheduling maintenance visits to the rooms that are having problems and unhappy guests. Unhappy guests can mean loss of revenue for the hotel and obviously any time staff has to take dealing with these problems is money lost. Number two, the problem it creates for the technician in finding and fixing the problem. Cabling issues create problems like pixiliation (that digitized look on the screen) and signal loss that comes and goes. They are intermittent so they are difficult to pin down the specific cause and time consuming to troubleshoot. This can lead to expensive service issues over time. So what is the next step for hotels that would like to install the DIRECTV Residential Experience at their property? Once you have talked to Barry Conley at Its All About Satellites about which hotel TV system is best for your property and decided you want the DIRECTV DRE, schedule a free site survey. Because any hotel TV system is going to be a major investment for you, it is so important to have an experienced DRE certified technician with the proper equipment to do a site survey and identify these potential issues. So give us a call and we will schedule to have one of our DRE certified techs come out and inspect your property.